The creative process begins with site visits. The artist immerses herself in the surroundings, both natural and man-made. She researches the surrounding community and analyzes how the site functions and how people move through and around it. If the site is an institution she learns about its culture, character, and mission as well as gaining an understanding of the program of any given facility. She takes photographs and collects other documentation, taking notes to help her define the scale, form, color, and overall feeling. She considers how people reading the work from varied perspectives will experience the work. "I want to give people something to pique their imaginations, something that will add a moment of beauty to their day." Mary Ann creates abstract forms that evoke images, which are often drawn from nature. Upon return to her studio, she produces many sketches and small-scale models. These evolve into larger models where form and color are further refined. A final design is selected, from which patterns are drawn for cutting sheets of aluminum or stainless steel. After the pieces are cut they are clamped and tacked together to create the desired form and then welded. Mary Ann designed her expansive studio at her home to accommodate large-scale sculpture fabrication. To assemble the sections of the sculpture the artist supports and stabilizes them using a hoist on a rolling beam. The spatial relationships are guided by the model, but further refined when assembled at full scale. The artist fabricates all of the mechanical connections within the sculpture and to the supporting structure. 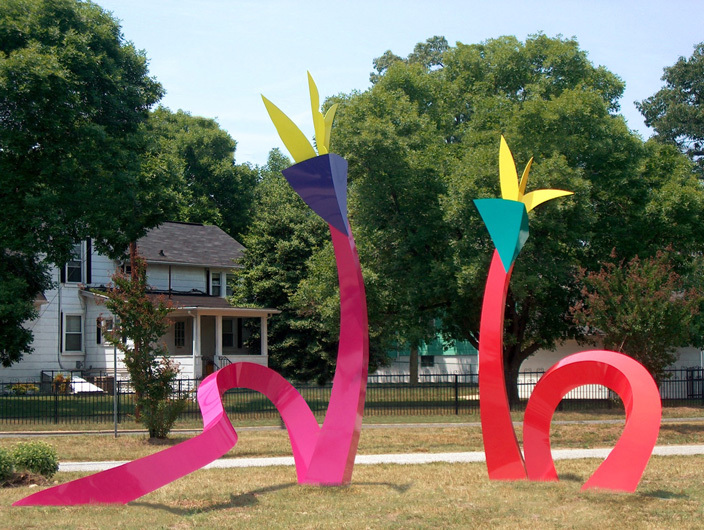 For certain very large projects the artist works with fabricators as needed. Painted work undergoes an extensive multi-step process of meticulous grinding, filing, sanding, etching, anodizing, priming with two primers, fairing, re-priming, sanding, and top-coating in the spray booth in the artistís studio to attain a brilliant high-gloss surface which will withstand the elements. Experienced crews are engaged for installations.